PWA WORLD WINDSURFING TOUR: Josh Angulo And Micah Buzianis PWA World Champions! Josh Angulo And Micah Buzianis PWA World Champions! 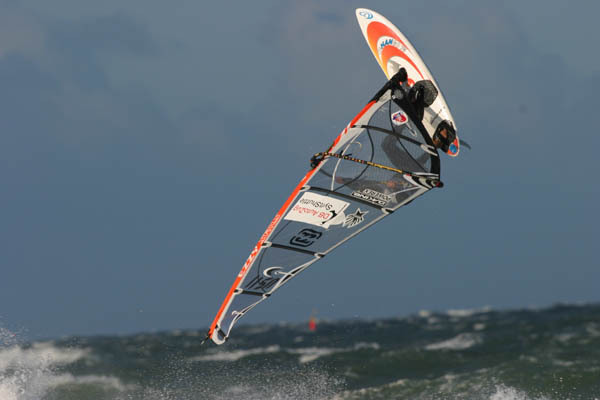 The Labello, PWA 2003, Sylt Grand Slam was the decider for both the 2003 wave and racing PWA overall world champions. US sailors Josh Angulo and Micah Buzianis both delivered the incredible performances throughout the season and won their respective titles. We talked to Josh and Micah for the low down on how they did it? Q: So Josh, how does it feel about becoming PWA world wave champion at last after chasing that goal for so many years on the tour? JA: First of all when I heard that I won, it was like this huge relief that ended up turning into this huge joy. I have worked hard to get there and I’m super fired up to be sitting in pole position! Q: What was the toughest heat in Sylt? JA: Mentally, my 3rd round heat against Jason Polakow, because that was a big heat really early on, after that, the biggy against Bjorn in the double elimination. JA: I was less nervous than I thought I might be. I really just concentrated on the heat and getting the points to advance. Q: How do you think you would of felt if you had lost to Bjorn? JA: I would have been shattered. To be so close and lose, that would have been a bummer. I had a lot of people pulling for me, it was definitely a moment that I needed to take advantage of. Q: Did you feel sorry for Vidar? JA: No, if I felt sorry for my competitors, I doubt that I would be on top. Q: Will you be back next year to defend your title? JA: I thought that when I finally won a title, I would be ready to just kick back, but it has made me hungrier than ever and I am looking forward to competing again next year. Q: Whom would you like to thank? JA: Jesus Christ, Mom and Dad, Claudia, Danielle, Mark, Andy, David Ezzy and family, Billabong , Powerex , Da Kine, Streamlined and all the friends and family around the world. Q: Was it a proud moment being up on the podium at the closing ceremony? JA: It was fun, but I thought Kevin Pritchard over did it with the champagne. I liked making the speech! Q: What’s next on the agenda for Josh Angulo? Q: Words to live by? Q: How does it feel to become the PWA overall race champion? MB: It feels like about time! This was my ultimate goal every since I started competing on the PBA/PWA world tour. It took me about thirteen years to finally reach the top I had a few seconds thirds and fourth on the way but it feels much better to finally reach the top rung! I am a lot more relaxed about my racing now, in my mind a huge pressure has been lifted off my shoulders. Don't misunderstand this though because I will still be giving it 110% in my training and my preparation because I still want to win! I am way too competitive to sit back and relax now. Q: Has that always been one of the biggest goals of your career? MB: This was always my main goal to win the PWA World Tour Racing World Title. I reached a lot of my other goals in racing but this was the one that had eluded me for so long. Q: How tough was the racing in Sylt? focused on just racing my own race and staying consistent. Q: Were you feeling the pressure from Wojtek in every race? MB: Mentally I wasn't feeling any pressure from Wojtek but I did see him a lot and every chance he got he would come and sit right on me even if it meant coming downwind a bit. He is notorious for doing this to people so I would just tack off or bear off a bit to get clean air, it didn't really bother me much as long as he was trying to sit and cover me I knew he wouldn't be able to finish far in front of me, which was what he needed to do in order to beat me! Q: Was there any race in particular this season that stands out as the one that clinched it for you? MB: Not really since we only had to race events they were all very important and had to count. After winning Leba though I was a lot more relaxed going into Sylt, you can get that way when you have a bullet in your pocket already. Q: What equipment were you using for most of the races? MB: I used my 11.7 for six of the race in Sylt, my 10.9 for three and my 10.0 for one. I used a 70cm C3 F fin for all the races this year and my sweet Bruce Wylie shaped Devil II! Q: Who would you like to thank? MB: Let’s see where to start there are so many people who have helped me get to this point, firstly is my family they have supported me in so many ways. My dad helped me move to Maui and become an addicted windsurfer and gave me my competitive drive. My mom and brother supported my move to Maui and my addiction to windsurfing. The one person that gave me the true chance to become a professional windsurfer and showed me all the ropes of how to do it and how to train and prepare for it as well as keep me on the right track is my first coach and best friend Pierre Jeangirard. I also really owe a lot to North Sails as they have supported me for over 13 years in this sport, Raoul Joa the brand manager. Sail designer Larry Herbig taught me a tremendous amount about sail design and made me some of the best sails I have ever had in the 8 or 9 years he has been with North he will truly be missed by me. Kai Hopf who has taken over the race sail design for North and made the sails that I raced on this year. Bruce Wylie who shaped the boards that I have been racing on for the last three or four years and who was my hero when I first started racing and let me travel and stay with him on tour. I also owe a lot to my testing partner at North Seth Besse who helped make sure all my equipment was up to speed. My very dear friend Jimmy Diaz who has been a huge mental support for me, very motivating and someone I can look up to. Scott Sanchez has also been a huge support mentally and physically preparing me to reach this point. Ross Ogeen in Maui who has always been there for me whenever I need anything. And last but most definitely not least my beautiful girlfriend Laura who puts up with me on a daily basis, which is not very easy trust me! I know I have forgotten some people but I need to keep this short or I could go on for a couple more pages, I can't forget my other sponsors though, Dave Dominy at Streamlined, Chip and Kevin at Ultra Nectar and V3S! MB: I will most certainly be back to defend my title next year! I figure I have about two or three more years left but then I look at Phil and at 40 he is right up there with us racing in every heat so maybe I have a couple more years that I could squeeze out. Q: Any tips for all the up and coming racers out there? MB: Work hard and never give up! Set lots of goals for yourself and then prioritize them and you will achieve them one by one. One thing I wish I would have done more of is write more stuff down, I have tried to keep a lot of notes on testing and racing but I wish I would have done more.